LOWELL, Mass. 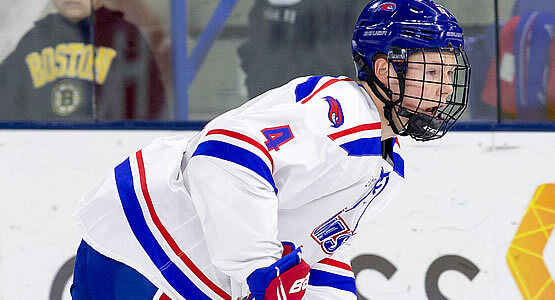 - The UMass Lowell Hockey team earned a 3-2 comeback victory against Hockey East rival Boston University on Friday night at the Tsongas Center in front of 5,688 fans. With the victory, the River Hawks improve to 9-7-0 overall (6-5-0 HEA), while BU drops to 7-10-1 overall (5-6-1 HEA). Senior forward Ryan Collins (Newton, Mass.) scored his second goal of the season just 8:42 into the third frame to seal the come from behind win with two goals in the final period. Senior defenseman Chris Forney's (Thief River Falls, Minn.) third tally of the year tied the game at 2-2 just 4:41 into the final period with a blast from the left point on the power play. Forney (1g,1a) and senior blueliner Tommy Panico (Wall, N.J.) each finished the night with a game-high two points. BU's Drew Melanson scored his fifth career goal to give BU the 2-1 advantage on the power play just 36 seconds into the second period. Brady Tkachuk opened the scoring in the game just 42 seconds into the game with his third goal of the season for the Terriers. Senior foward Jake Kamrass (Atlanta, Ga.) tied the game at 1-1 with a power play goal for his fifth of the season at 7:34 of the opening period. Junior goaltender Christoffer Hernberg (Espoo, Finland) made 24 saves in his ninth win of the season, while BU's Jake Oettinger took the loss with 27 stops. UMass Lowell outshot BU, 9-5 in the opening frame and finished the night 2-for-7 on the power play. The River Hawks return to action on Saturday, December 9th at Boston University. Game time from Agganis Arena in Boston is 7 p.m.